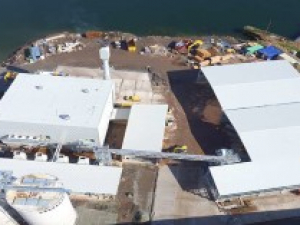 The construction of this new state of the art CHP Plant provides the final link in transforming Glennon Brothers Troon into fully integrated site. Internal and external M&E services to new build facility housing a 8MW biomass combined heat and power (CHP) installation on the site within an existing operational sawmill. The CHP unit generates up to 2MW of electricity via steam turbine to the national grid. Heat left over from this process is used to provide hot water to progressive wood drying kilns via a district heating pipework system. The whole CHP unit used the waste product woodchips left over from the sawmill process.